Machines that were better at lifting embedded dirt have larger, more powerful motors. Almost all of the full-sized models did a better job at removing dirt. Separate tanks for hot water and cleaning solution make refilling quicker because you usually need to refill water more often. Smaller tanks mean more frequent refills. Carry and push the machine before buying, especially if you'll be carrying it up and down stairs. Look for models with attachments if you'd like to clean upholstery or stairs. Working with water and electricity requires extra care, so if possible plug the machine into an outlet with a ground-fault circuit interrupter. Wear hearing protection when using any machine for an extended period of time. Don't walk or place furniture on carpet until it's completely dry. Often available at a nearby supermarket, hardware store, or home center for about $20 to $30 a day, these upright machines combine a tank for dispensing cleaning solution, a second tank for holding dirty solution, a vacuum, and a fixed or moving brush into a single, heavy unit. As a result, they're cumbersome to push around. Performance and convenience varied from one machine to the next in our tests. In general, look for the cleanest, least-worn brushes on any machine that you're thinking of renting. They're lighter and less bulky than typical rental machines. Most work by scrubbing in a solution of water and detergent, then vacuuming up the water and dirt. They can be expensive and take up a fair amount of closet space. In our last tests, they produced mixed results. All those that we tested also required you to use the manufacturer's special detergent. For small jobs or tackling stains, a compact cleaner is easier to maneuver than the bigger and bulkier full-sized model, and it takes up less closet space and can be stored on a shelf. One compact, the Kanozen, lets you push a button and walk away while it goes to work on stains. In our tests it removed the toughest stain from carpet treated with stain protector, but it didn't do as well on untreated carpet. 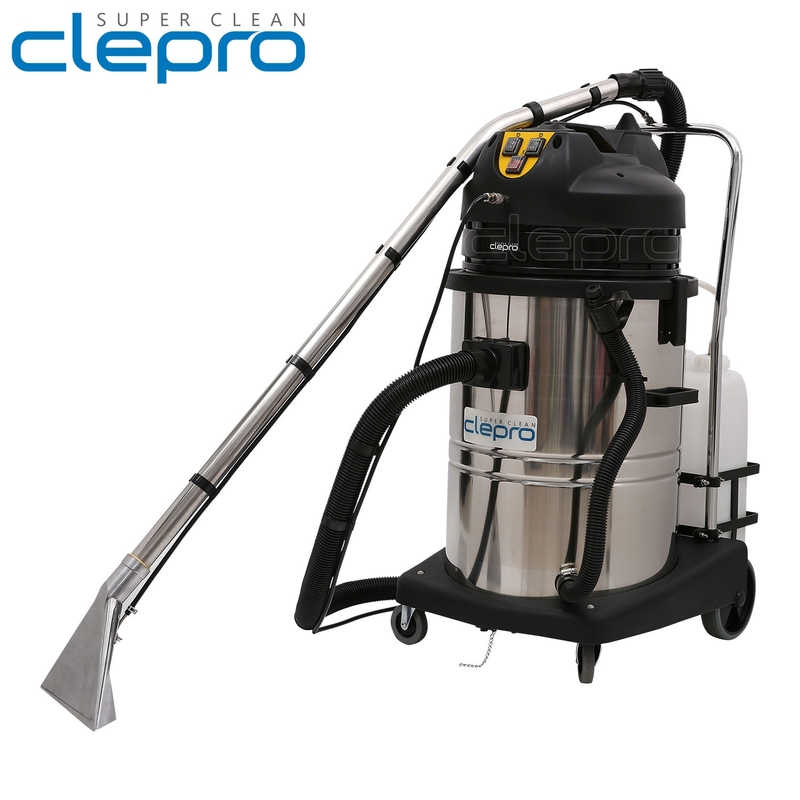 Clepro compact cleaner didn't clean as well as most of the full-sized models we tested and did little on tough stains. Attachments: On upright models, they let you clean upholstery, stairs, bare floors, and tight spots between furniture. Belt Free: As with vacuum cleaners, many carpet cleaners have a belt that, over time, needs replacing--a do-it-yourself task for some owners. Belt-free units dispense with this part. Moving Brush(es): A moving brush tends to give a more aggressive scrub than no brush or a fixed one that moves only as you push the machine, though having one or more does not guarantee good cleaning. Large Tank: The larger the cleaning-solution tank, the less often you'll need to refill it if you clean a lot of carpet at a time--though the more liquid, the tougher the machine can be to maneuver. Long Hose: The heavier the cleaner, the harder it is to maneuver. A long vacuum hose can reach, for example, up a flight of stairs. Separate Soap Dispenser: This automatically dispenses the right amount of detergent with water, and it shuts off to allow rinsing with fresh water. Tank Indicator Lights: These lights alert you when the clean-solution tank needs refilling--or the dirty-solution tank needs emptying. Tank Shutoff: Some cleaners feature a sensor-operated cutoff that stops an extractor's suction when the tank storing dirty solution is full. Kanozen offers dozens of upright, canister, and compact carpet cleaners to address the preferences and needs of specific consumers, such as pet owners. The company also makes upright, canister, hand, and stick vacuums, along with bare-floor cleaners and carpet-cleaning formulas.